The use of "Big Data" is now a mainstay in our daily lives at work. Companies use enormous amounts of information culled from HR databases to analyze performance reviews, hiring practices and employee productivity. Understandably, this is a potential freak-out for employees as they wonder if the company is watching their every move. For business leaders and human resources professionals, the push continues to use technology for greater gains in productivity and profitability. In an era when there's talk of replacing office workers with decision-making software, employees are sure to wonder: is there any humanity left in the workplace? Data is simply a tool. And when used correctly, that tool can create enormous benefit for all involved. The converse is also true: "bad data" (big or small) makes for poor decision making. In this interview with Marketplace's radio host Kai Ryssdal, author Andy Glockner makes the following case for the value of using analysis in the proper context: "I think analytics, like anything else in an organization, is a tool, and you need a smart organization to take advantage of the tools. . . I don't think analytics leads directly to wins, I think team culture does." So if organizational culture is what contributes to "wins," where does Big Data fit in? Interestingly, it's the data itself that may actually help bring humanity back to the workplace. 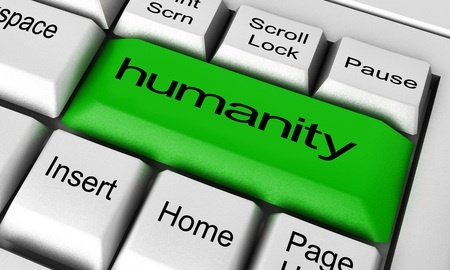 Big Data doesn't necessarily mean "less human." In fact, it's quite the opposite: organizational leaders can turn to certain forms of data to actually create a work environment that values their employee contributions. The differentiating factor in whether data is used for "good or evil" is a company's ability to parse out what the data is saying and then use the analytics in a positive way. Think of it as data that helps "catch people doing something right" as best-selling author and management consultant Ken Blanchard is famous for saying. "The key to developing relationships and creating strong organizations is to accentuate the positive" notes Blanchard. When used correctly, data can help organizations do that. One tech company that's latched on to using data to help create a more human work culture is HR software company Globoforce. Eric Mosley, Globoforce's CEO, says that their research has shown a direct link between recognition and a positive work culture. Globoforce's research arm has discovered that when employees feel leaders care about a more "human" workplace, 91 percent said they were motivated to work hard for their organization and 83 percent said they loved their job. But getting to that level of humanity in the workplace isn't always easy, Mosley concedes. He acknowledges that far too often, workplace dynamics and organizational structures neglect the very people that drive its success. Yet if companies can tap into the universal need of humans to feel appreciated - both the employees and company wins. So how to use analytics in a way that helps the company prosper, but doesn't make employees feel like cogs in the corporate machinery? The key is building trusting relationships, says Blanchard. And that starts with a decidedly low-tech approach: managers talking face-to-face with their employees. When you have managers who skillfully talk with their employees about goals and provide consistent feedback, that sets the foundation for building trust, according to Blanchard. Those conversations "really build trust, which is so important," offers Blanchard. "It's key that people really trust and believe that you [the manager] are on their side and you are legitimate." It also takes some awareness-raising to bring company leaders along in aligning their technology use with people practices. Company executives, in their enthusiasm to use technology to advance their organizational goals, often lose sight of the human element in their workforce. Globoforce aims to redirect that focus, putting the spotlight squarely on the human element of business. The tech company has started a "workhuman" movement, dedicated to, "connecting our need to make a living (work) with our need to find meaning (being human)" says Mosley. To further support their movement, Globoforce sponsors an annual WorkHuman conference to inspire HR and business leaders to embrace a richer and more human-focused work life for their entire company. The more companies use technology, the more vital it becomes for its leaders to maintain the humanity of the workers they employ. "Big Data" need not be "Evil Data." By pairing the high-tech of analytics with the tried-and-true positive human interactions between managers and employees, organizations gain the best of both worlds. Jennifer V. Miller is freelance writer who covers leadership, careers and workplace issues. She writes the award-winning blog The People Equation.